I unexpectedly received WITCH HUNTS as a review copy. I say unexpectedly, but with Lisa Morton’s name on the cover it wasn’t completely unexpected as she knows I devour her work. At any rate, for some reason I put this one off despite the fact that it is a graphic novel and would be a quick read. The only reason I can give for this is that I am not a fan of history… at all! That being said… after all of the craziness that occurred on Facebook about this book being banned (see Rocky Wood’s blog post here) and also getting to meet Rocky Wood in the flesh, I picked this book up finally. Remember, I said I pretty much hate history, however this book was absolutely amazing! I was a little familiar with some of the witch hunt acts that had occurred over the years, but hadn’t heard of nearly as many as Rocky Wood and Lisa Morton compiled into this one graphic novel. Not only did they have detailed facts about the witch hunts throughout the years, but they wrote about them in a way that was fun to read. Yes, I just used the word “fun” in referring to history. Additionally, the artwork that is supplied by Greg Chapman in this book is absolutely phenomenal! Excluding the cover, the artwork is completely in black and white, but I think color would’ve taken away from the style of this book and the fact that it was depicting olden times. Whether you are looking for a book to educate yourself quickly on witch hunts or you just want an entertaining graphic novel to read, I’d definitely recommend picking this one up. I’m actually thinking about re-reading it soon as I don’t retain very well and I’d like to remember a few more of the facts that this book is jam packed full of. Again, this coming from an anti-history person. I’m sure some of you history buffs out there will get even more from this very well written and drawn book depicting tons of witch trials that took place over the course of time. That being said, the book is currently available on Amazon both in print and in Kindle format. Normally I link to the Kindle version of books only as that’s typically what I read, but due to the artwork in this one I’d recommend having a print copy in your hands. I’ve linked to both within this text so you have the option, but I highly recommend shelling out a few dollars more to get the print version! Alternately you can purchase this book directly from the publisher, McFarland Publishing via their website or you can order from them at 1-800-253-2187. And if my recommendation of this book is not enough for you, might I add that this book even won the Stoker award this year for Superior Achievement in a Graphic Novel. 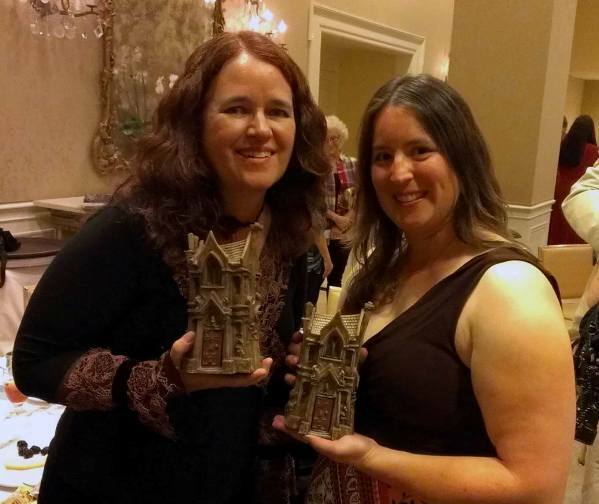 Below is a picture of me with Lisa Morton (left) at the Bram Stoker Awards Banquet holding her two Stoker Awards, the one I just mentioned and another one for Superior Achievement in Non-Fiction for her book TRICK OR TREAT: A HISTORY OF HALLOWEEN.